When you take the saddle off your horse after a good ride, what do you see? Your horse’s back, where the saddle and saddle pad were placed, is damp with sweat. This got one girl in Montana thinking about saddle pads and keeping her horse cooler. Twelve-year-old Cortnee Annello designed a science experiment to help her learn about a horse’s core body temperature and the best saddle pad material to use to keep her horse as cool as possible during a ride. Cortnee riding her registered paint, Smooth Rockin’ Easy. She calls him Smoothie for short. Science Talk – core body temperature: the temperature in the part of the body containing the vital organs (the brain, heart, lungs, and kidneys). The core temperature is measured internally and it usually remains within a narrow range. During exercise, heat is generated and the muscle temperature rises, raising the core body temperature. 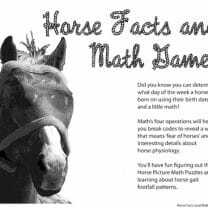 A horse’s average core body temperature is 99-101°F (37.2-38.3°C). How close is that to your own average temperature? The average core body temperatures for humans is 97.7–99.5 °F (36.5–37.5 °C). Unlike other animals, the horse also sweats like a human to lower their body temperature. 1. 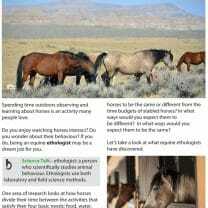 What is the difference in the range of core body temperature between horses and humans? For her experiment, Cortnee compared a wool saddle pad with a polyester saddle pad. Take horse’s core temperature. This is done using a rectal thermometer. Saddle your horse with the polyester or wool saddle blanket. Ride your horse for 25 minutes consisting of the same work out each time. Begin the workout with 10 minutes of groundwork consisting of jogging and walking. 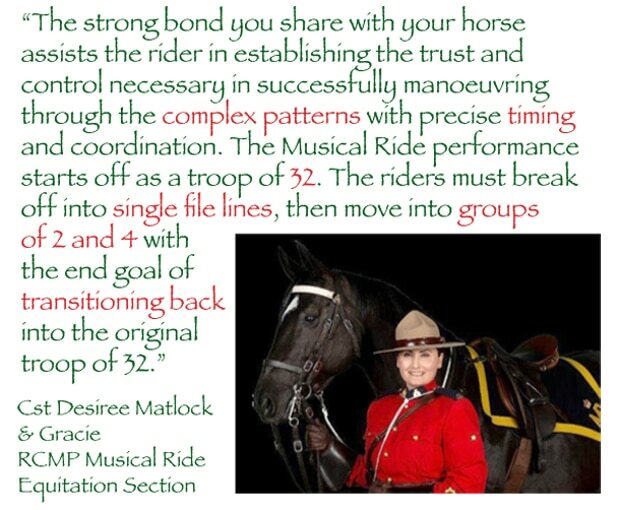 Then mounted do 5 minutes of walking and flexing circles for your horse. End with 10 minutes for slow jogging circles and loping. 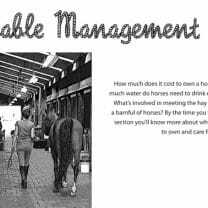 Take horse’s core temperature and back temperature. Record observations of sweat build up and dampness of pad. Science Talk – procedure: a series of actions conducted in a certain order or manner. Cortnee conducted her experiment six times, three times using a polyester pad and three times using a wool saddle pad. She also researched the different materials, learning about their good and bad qualities. Her data comparing core body temperature was displayed using the bar graph shown to the left. 2. Is this a horizontal or vertical bar graph? 3. What is the scale used for the vertical axis? 4. What do the yellow columns show? 5. Which test showed the biggest increase in body core temperature? 6. Which test showed the least increase in body core temperature? 7. Which material kept Smoothie’s core body temperature the lowest? I figured out that taking a horse’s temperature is more nerve racking than you think. The second time I did my experiment it was a little better. It was shocking [to find that] the temperature under the saddle blanket was cooler than the horse’s body temperature. The polyester did not absorb the sweat from the horse. His hair on his back was wet and had some sweat even running from under the pad. I am getting to be a real pro at taking the temperature. I am conducting my last polyester test today. The temperature outside is very cold today and could be affecting my results. I found that my horse’s body temperature increased considerably during this work out with the polyester pad. 8. What is the scale on the vertical axis in the ‘Comparing Back Temperatures’ bar graph? 9. Which experiment resulted in the highest back temperature reading? 10. Which experiment resulted in the lowest back temperature reading? 11. Which material kept Smoothie’s back the coolest? Cortnee was 12 when she started this experiment and is now 13. The design of the experiment and project was completely her own. Cortnee has completed three Vet Science projects. Her passion is riding horses, and she hopes to have a career that includes horses in some way. Thank you Cortnee for sharing your vet science project with others. Now we can all learn from your experiment! Step 1: 99°F – 97.7°F = 1.3°F. There is a difference of 1.3°F at the low end of the range. Horses being a little bit warmer. Step 2: 101°F – 99.5°F = 1.5°F. There is a difference of 1.5°F at the high end of the range. Step 1: 37.2°C – 36.5°C = .7°C. There is a difference of 0.7°C at the low end of the range. Step 2: 38.3°C – 37.5°C = .8°C. There is a difference of 0.8°C at the high end of the range. Answer: Each line represents .1°F (on tenth of a degree). 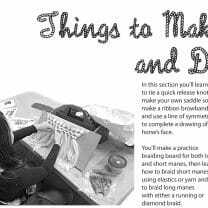 I will use these ideas for science fair.